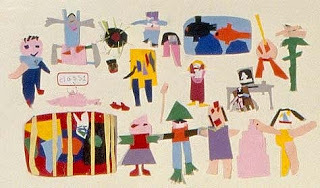 The children use paper and glue to depict their individual classrooms for an all-school mural. For all ages. Plan 1 to 2 sessions. Divide the area for the display into classroom sections, making sure that each section is large enough to contain the children's figures. If attaching the figures directly to the wall (as shown in this lesson), you will need lots of adhesive putty. Another approach would be to cut paper for each classroom the size of the allotted sections. Have the children glue their figures onto the papers, which can then be attached to the wall using less adhesive putty. 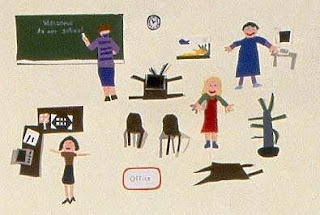 If putting the display on a bulletin board, the children can attach their figures using straight pins. When all the figures are in position, replace the straight pins with staples. Explain to the children that they will be working together to make a mural which is a large display attached to a wall (or bulletin board). Using paper and glue, they will make items that define their classrooms, such as fellow students, teachers, books, bookshelves, chalkboards, charts, fishbowls, plants – anything that will make their classroom recognizable. Show the children the section of the mural designated for their classroom. 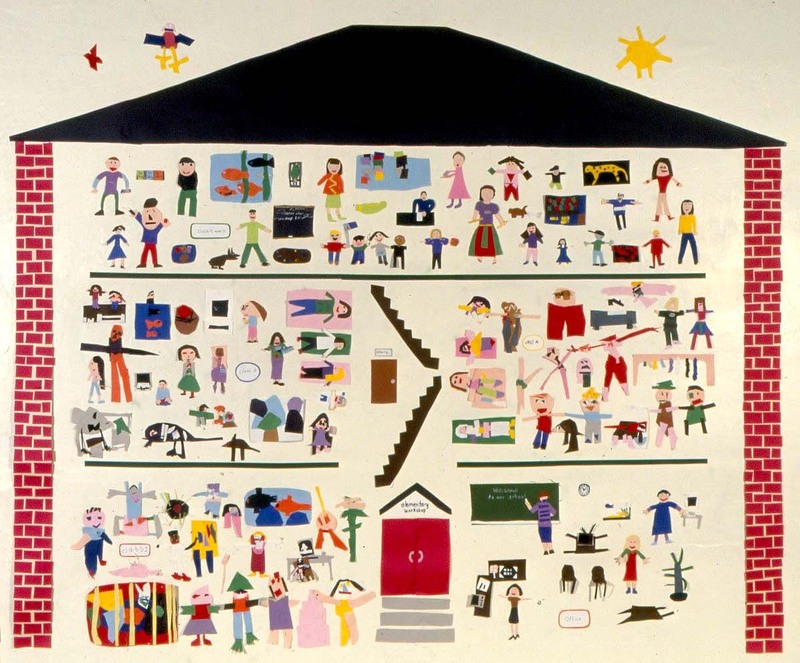 Explain that the figures they make should be large enough to be seen in the mural, and yet small enough to allow all of the figures for their classroom to fit into the space. Remind the children of the proper way to hold and use scissors. The thumb goes in the small hole and two or three fingers go in the larger hole. With the blade of the scissors opened wide, place the paper deep into the opening, taking advantage of the whole blade while cutting. For a circular shape, use one hand to slowly close the scissors while using the other hand to gradually turn the paper. Continue opening and closing the scissors while turning the paper until a circle is completed. Show the children how to attach two pieces of paper with glue, emphasizing that the glue should be applied to the smaller paper and pressed onto the larger paper. Warn the children that it doesn’t take much glue to attach the pieces. They can use the dampened sponges to wipe sticky fingers. Discuss with the children the unique characteristics of their classroom and decide together which figures they will each be contributing to the mural. 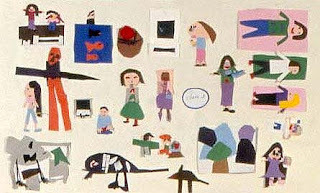 After the figures are finished, have the children arrange them on the wall in a pleasing, or balanced, manner using small pieces of adhesive putty; or glue them to a sheet of paper to be hung on the wall with adhesive putty; or attach them to a bulletin board with straight pins that will later be replaced with staples. Note: Add a small label to each classroom identifying the room number, grade level, or ages of the children. This is a good project to do at the beginning of the school year. Working together to decorate the school, the children become familiar with their classmates and the art room. The display seen in this lesson was attached directly to a large wall in the art room, intriguing everyone who entered the room. Very small pieces of the adhesive putty actually work better than larger pieces when attaching the figures to the wall. Be sure to test that the putty will not peel the paint or leave marks on the wall. When working on a bulletin board, attaching the figures with straight pins allows the figures to be moved around until a balanced design is achieved. When the design is completed, the pins should be replaced with staples. 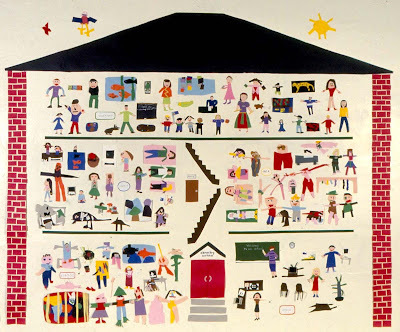 If possible, use the layout of the school in the mural to make the display more personal. Watch that the children's work does not become too large to fit into the allotted sections. For the younger children, this was a one-session project. The older children used a second session to make the schoolhouse walls, stairs, doors, and school office (shown below). Review what makes this artwork a mural. Discuss the characteristics that make the classrooms recognizable. Do the figures in the classrooms fill the sections in a balanced way? I want to make our pet gerbil, and so does Alex. Our classroom only has one gerbil! I’m having trouble cutting this paper. My fingers are all sticky from the glue. Every time I come to the art room, I like to look at our mural. You and Alex could work together to make the pet gerbil with its cage. When cutting your paper, be sure that your thumb is in the small hole and your fingers are in the large hole. You can wipe sticky fingers on the dampened sponges. I agree. I discover new and interesting things each time I look at it.